If you have a sizable DVD collection, how can you organize it well but save energy and time? Ripping DVD is the suggestion, which can not only make a digital backup on a hard drive or other storage devices but has original DVD movies/TV shows watchable on mobiles. DVD ripping software can greatly simplify the digitization. HandBrake is the big name. It offers an easy but powerful solution to free rip DVD to MP4 or MKV. However, without internal decryption, it is unable to handle copy-protected DVD. WinX DVD Ripper, a stronger rival to HandBrake, unlocks more power on DVD ripping. It boasts ripping virtually all DVDs to digital for playing on a computer, smartphone, tablet and more. 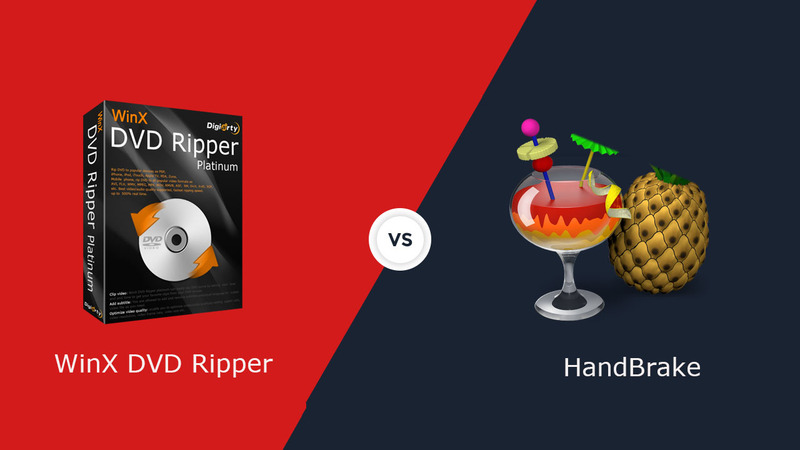 HandBrake vs. WinX DVD Ripper: Which Is Better to free Rip DVD? HandBrake officially announces nonsupport of encrypted discs while libdvdcss can work as an assistant to help HandBrake to free rip DVDs protected CSS or related schemes. WinX DVD Ripper builds in a DVD decrypter engine so that it can support not only unprotected homemade discs but commercial DVDs with various encryptions, even the latest DVD movies, workout DVDs and more. What’s more, WinX DVD Ripper is recognized as a great DVD backup tool for it can copy old and even scratched DVDs while keeping whole DVD content. HandBrake uses 4 video codecs – H.265, H.264, MPEG-4, MPEG-2, – allowing users to convert DVD to MP4 or MKV. 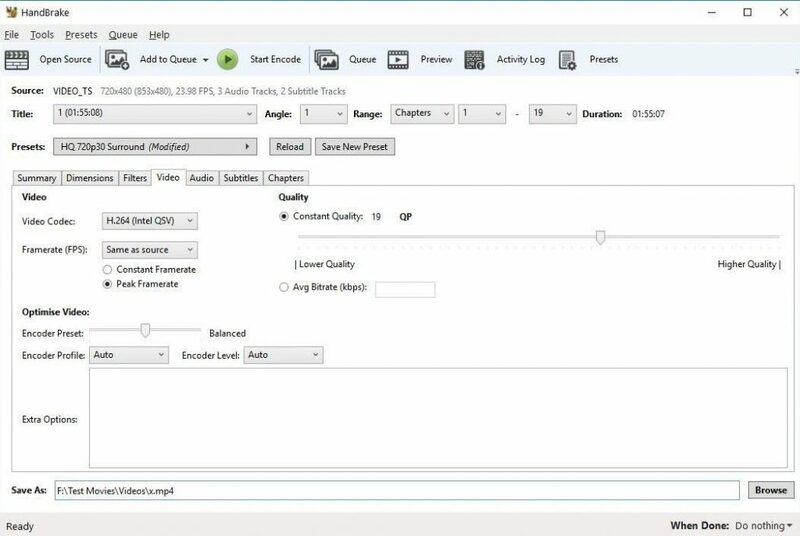 In addition, it offers several sets of presets for devices, web for users to get an output fitting for playback or uploading requirement. WinX DVD Ripper provides a wider range of outputs. It has a comprehensive output profile list including mainstream formats – MP4 (H.264), AVI, WMV, MOV, FLV, WebM; popular devices – iPhone, iPad, Samsung, Huawei, Xbox, PS3/4; web – YouTube, Facebook; and so on. It also provides DVD backup modes allowing users to copy DVD to ISO Image, VIDEO_TS folder and a single MPEG-2 file with all video, audio, and subtitle tracks. Deinterlace, a technique to change interlacing scanning mode to progressive scan, is utilized by both HandBrake and WinX DVD Ripper for video quality optimization. Besides, HandBrake adopts Denoise to remove grains on video while WinX DVD Ripper wraps High-Quality Engine to improve output video effect. Through our test, WinX DVD Ripper indeed delivers a greater quality keeping 98% of original quality while HandBrake lowers the quality to a certain extent, only 70% of the original. HandBrake supports hardware-accelerated video encoding thanks to the utilization of Intel QSV from version 1.0.0 and NVIDIA NVENC from version 1.2.0. After enabling GPU acceleration, it takes about 18 minutes to rip a 2.5-hour movie. WinX DVD Ripper takes advantage of level-3 hardware acceleration invoking graphics cards (Intel, NVIDIA, AMD) to speed up video encoding, decoding, and processing. Plus Super Encode Engine, Hyper-threading Tech, it delivers about 2x faster speed than HandBrake, about 9 minutes to rip the same movie on the same machine. Both HandBrake and WinX DVD Ripper are easy-to-use. Compared with WinX DVD Ripper which has a more straightforward interface, HandBrake provides some complex options so that you may need to take more time to learn how to customize settings. Load your DVD disc into HandBrake. Choose a preset or output format. If you want to get hardware-accelerated encoding, go to the Video tab and select the codec with Intel QSV or NVIDIA MVENC. Click the Browse button to select a folder for saving the resulting file. Click Start Encode to rip your DVD. Click DVD Disc to import the DVD. After Output Profiles window pops up, select an output format. For example, if you try to free rip DVD to MP4, go to General Profiles > MP4 Video > OK.
Click the Browse button to define a destination folder. Click the RUN button to start ripping DVD. Please note that Hardware Accelerator (Intel, NVIDIA) is automatically enabled for helping you rip DVD at maximum speed. WinX DVD Ripper is a much better choice for beginners. It can natively free rip copy protected DVDs to MP4 or other formats without third-party library installed. It is also superior to HandBrake in the aspects of quality and speed. On the other hand, HandBrake is preferred by geeks because it offers more customization options helping get a personalized resulting file fully meeting their desire.